14-May-2015 -- This is the 3rd out of 12 reports reaching confluence points along the 51°N-line. The story starts from 51°N 14°E. After a drive of 1:10 hours with our rental car from 51°N 13°E, we reached the dead end of this confluence at 7:15 AM. We parked at a distance of 72 m at a little roundabout which is the end of the road. The owner of the confluence was already there as if he was waiting for us. We explained to him the concept of visiting confluence points. But he answered that “it is not possible to visit the confluence, because it has been removed”. A lengthy discussion about geo-caching and confluencing followed. Just when I gave up and said that we don’t need to enter his property because the current distance of 70 m is good enough, he let us inside to visit his sacred wall in his garden, hoping that we are the last visitors ever. I said that I can’t guarantee that other visitors will never come in the future, suggesting he should ask for a visiting fee. According to our measurements the actual confluence lies 5 m behind his mysterious wall. 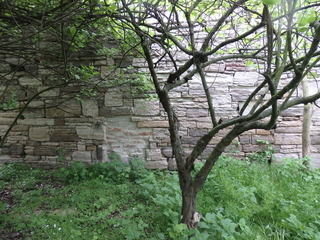 The garden is overgrown with quince trees, nettles, and ivy. Again, we didn’t hang around for a long time at this confluence, since we didn’t want to bother the man more than necessary and we had anyway planned to visit another 9 confluence points before end-of-day. The story continues at 51°N 11°E.